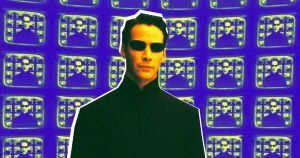 Philosopher of Simulation Hypothesis Hadn't Seen "The Matrix"
Nick Bostrom doesn't think you should try to break free from the Matrix. In 2003, Nick Bostrom blew minds with “Are You Living in a Computer Simulation?,” a hugely influential philosophy paper positing that — you guessed it — our reality could actually be a computer simulation. If you’ve seen “The Matrix,” that theory might sound familiar — in the film, a hacker joins a rebellion against artificially intelligent machines that have trapped humanity in a simulated reality (“the Matrix”) so they won’t freak out while the AIs harvest their bodies for energy. But according to a newly published Vulture interview, Bostrom hadn’t actually seen the 1999 blockbuster when he drafted his paper. A glitch in the Matrix, perhaps? Not likely, according to Bostrom. He believes his penning of the simulation argument was the logical result of two things: his interest in observation selection theory, which was the subject of his doctoral dissertation, and his fascination with the potential impact of advancing technology on the future. Humanity will very likely go extinct before reaching a “posthuman” stage. We’ll reach this “posthuman” stage, according to Bostrom, when we unlock nearly every technological capability possible given the physical limitations of our universe. This would include the technology needed to run convincing simulations of reality, the kind that had Neo believing he was a computer programmer named Thomas Anderson. Humanity will reach the “posthuman” stage, but “is extremely unlikely” to run a significant number of simulations of its history. If this one turns out to be true, hopefully it’s because we’re too busy doing something cool like forming galactic alliances or opening the world’s eighth Jurassic Park. We are “almost certainly” living in a computer simulation of a “posthuman” civilization’s history right now. This one has math on its side. After all, if humanity has already reached a “posthuman” stage and did decide to run simulations, there should be a ton of those simulated realities and just one “real” reality — making it far more likely we’re living in one of the fakes. If our reality is, well, real, it seems we still have a ways to go before we reach the “posthuman” stage (if we reach it — see Statement #1). But that hasn’t stopped everyone from Neil deGrasse Tyson to Elon Musk from mulling over Bostrom’s theory. Some tech billionaires are even reportedly paying scientists to try to break us free of the simulation on the off-chance that we are already in it — and Bostrom thinks those folks need to slow their roll. Hear that, Silicon Valley? The Matrix isn’t going anywhere, so maybe take a beat before you try to force-feed humanity the red pill. More on the simulation theory: Are We Living in a Computer Simulation? Elon Musk Thinks So. Simulation Hypothesis: How Could We Tell If We Are Living in a Computer Simulation?